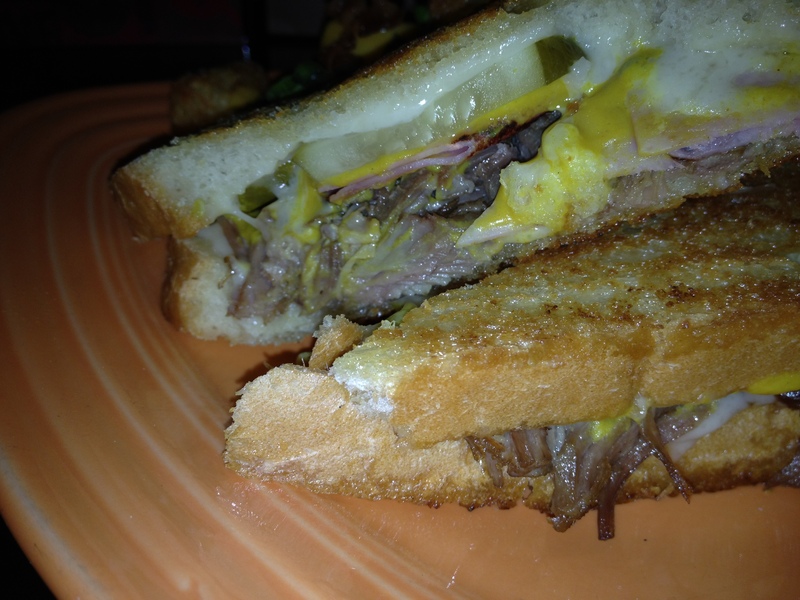 Urban Saloon’s Cubanish Sandwich | DidjaEat? One of the things I do on a regular basis is stand up comedy. There is an Open Mic on Monday nights at Urban Saloon called Laughs on Fairmount that I try and hit weekly. It’s a fun mic with a great vibe. 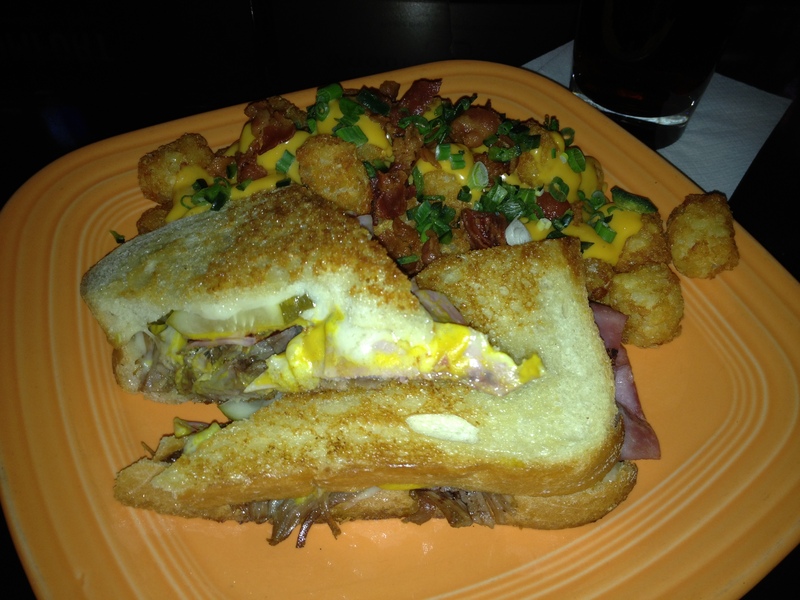 Just as importantly, Urban Saloon has some great food. Last week they updated the menu and, being the glutton I am, I decided to give something new a shot. The new Cuban Sandwich. 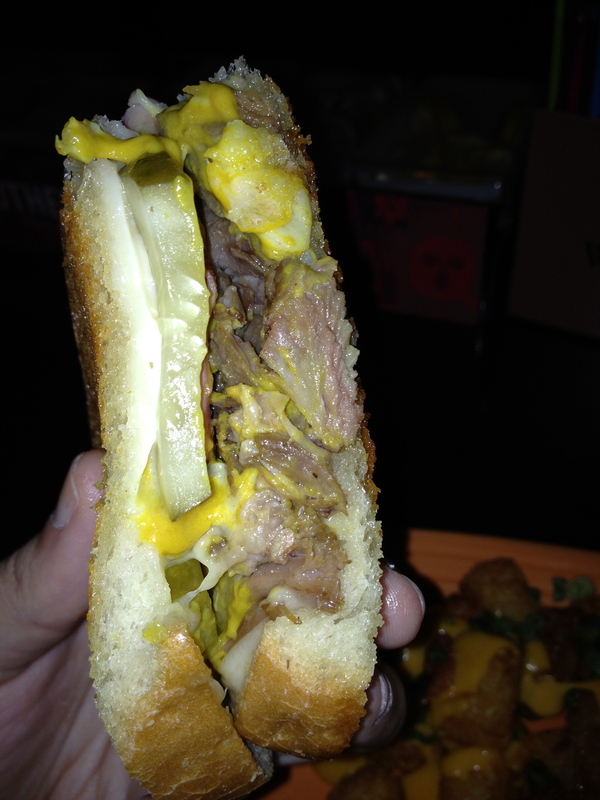 This Cuban sandwich has pork, ham, cheese, pickles and a nice mustard on both sides. The pork is pulled and the ham was grilled before putting this thing together. They weren’t skimpy with the mustard and it was nice and warm when I got it. Overall, it was delicious. I opted for loaded tater tots instead of fries (or a side salad) because Urban makes the absolute best with bacon, cheese whiz and green onion. Oh my god, they are awesome! Perfectly fried and the bacon is obviously not from a can or a bag. I have had them many times and I swear to you, you will never find a better tot plate in this city. cuban-ish sandwich, is this: Cubans are made on a roll. Always on a roll. Then you press it and it moves into delicious territory. This sandwich was made on white bread. So, technically that makes it a crazy good grilled cheese with meat..and a pickle. I’m still kind of puzzled about that. Maybe the kitchen didn’t have any rolls? Maybe they dropped the sandwich and it was the last roll and they had to remake it with white bread? I have no idea. It was a good sandwich (which fantastic loaded tater tots) but not being on a roll was just weird. If they add a roll, this thing could be a huge, huge seller. Posted on December 15, 2011, in bar food, condiments, junk food, sandwiches and tagged cheese whiz, cuban sandwich, green onion, grilled cheese, open mic, side salad. Bookmark the permalink. Leave a comment.